PV materials manufacturer DuPont is putting its money where its business is and recently completed the company's 10th solar project, a 1.3 MW facility in New Jersey. It's difficult to find a company with stronger roots in the solar power industry than specialty materials manufacturer DuPont. Beginning in the 1950s, DuPont provided the first purified silicon for the Bell Labs experiment demonstrating the very first solar cell. In the years since, DuPont has developed into a leading manufacturer of specialty materials for photovoltaic (PV) solar panels. In fact, it has materials in over half of the 300 million solar panels installed world-wide since 1975. DuPont truly believes in putting its money where its business commitments are, and with that has made a substantial investment in installing solar panels on a number of its facilities in the U.S.
DuPont recently installed its 10th company facility solar project at a manufacturing plant in Parlin, New Jersey, about 25 miles southwest of New York City. The eight-acre, 1.3 megawatt solar array is designed to generate approximately 1,684,170 kilowatt hours in its first year of operation, roughly equivalent to the electrical demand of 145 average U.S. households. This brings the total solar energy generated from the 10 existing DuPont solar installations world-wide to more than three MW, helping to further the company's aim to reduce dependence on fossil fuels. 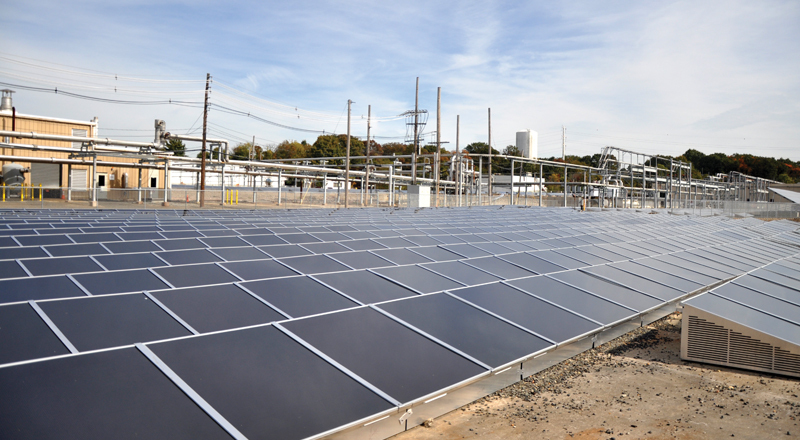 The Parlin project is the largest solar array on a DuPont manufacturing site in North America. The 220-acre production facility manufactures a number of products including Teflon non-stick coatings for cookware and electronic resins for the computer industry. All of the 1.3 MW generated by the solar project will be used by the manufacturing plant. "DuPont has been a leading materials supplier to the photovoltaics industry for more than 30 years, and we are growing fast as a consumer of solar power," said David B. Miller, president, DuPont Electronics and Communications, at the opening of the facility. "Solar is becoming increasingly more competitive with other sources of electricity, in part due to advanced materials that improve efficiency and lifetime and lower overall system costs." Logan Powell, DuPont's market development manager, explained that there were several reasons for building the Parlin solar power facility. "The Parlin project was set up to see how we could leverage our knowledge in the solar industry and also how we could use some of that knowledge to help the company with its sustainability goals," he said. "We also wanted to get some experience with DuPont Apollo solar panels in the North American market," Powell added. The system features more than 7,250 solar panels manufactured by DuPont Apollo, a wholly owned subsidiary of DuPont and a photovoltaic company specializing in high performance/high quality silicon-based thin film photovoltaic technology. DuPont Apollo products have been used in utility-scale projects across the globe, including the largest thin film solar farms in India and one of the largest thin film solar farms in Thailand. Of the company's 10 solar power projects, six are in North America. The solar projects have been done under another company division, DuPont Photovoltaic Solutions. The Parlin project represents the largest project, by far, in the U.S. It was also the first solar project built with a power purchase agreement. Powell explained that the project's 1.3 MW size was driven by the land available at the Parlin facility. "It's a unique situation in that the solar array sits in the middle and is surrounded by plant buildings." It's kind of the solar hole in a manufacturing donut, he says. He noted that, to some extent, they had to work with existing facilities in the space. "There were overhead power lines and other utilities that were already there. Some buildings that had been on the site had been taken down, but the foundations and subgrade remained." Since there were existing foundations, DuPont wanted the racking systems to be completely above grade. SolarDock ballasted racking, which does not require any ground penetrations, was used. The panels were placed at a 15 degree angle. 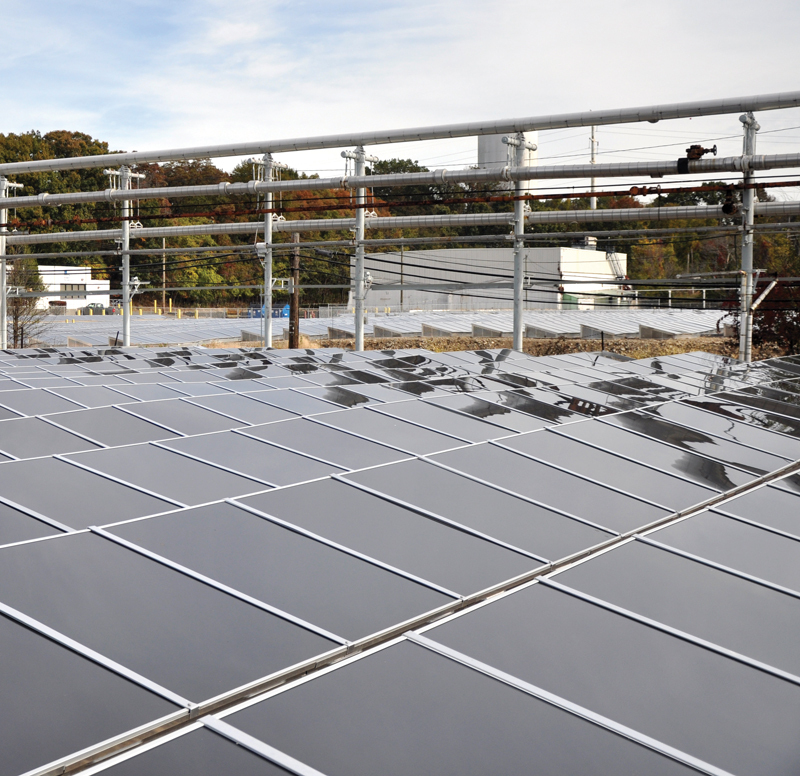 The solar array was developed and is being operated by Tangent Energy Solutions, a Pennsylvania-based energy company that specializes in developing and integrating clean generation assets into the energy systems of commercial and industrial companies. DuPont's power purchase agreement is with Tangent Energy. The project's 1.3 MW size was driven by the land available at the DuPont Parlin production facility. It's a unique situation in that the solar array sits in the middle and is surrounded by plant buildings. It's kind of the solar hole in a manufacturing donut. In terms of construction, Powell noted that DuPont had a company representative on site, to coordinate the project with Tangent Energy and the group of suppliers and contractors on the project. "We had a good process in place for getting people on and off the site." And DuPont wanted this all done safely. "Safety is very important to DuPont," says Powell. "We wanted to achieve a zero incident construction build, so all of the contractors who came on site went through a safety training seminar and had to be qualified with background and credential checks, to work on the site." That safety goal of zero incidents, Powell said proudly, was achieved. With a constrained work site, Tangent Energy had a well-developed plan for staging materials, with kind of a just-in-time approach to moving materials on site. The 1.3 MW system that was built adds to an existing 50 KW solar power system that had been operating for about a year. Since they already had a solar power system in place, DuPont had plenty of information about solar conditions in this part of northern New Jersey. Solar irradiation levels are reasonable in the region, though they don't compare to the solar hotspots in the U.S. southwest. But solar power project construction is about more than solar levels. "New Jersey state solar power incentives are very attractive for a power purchasing agreement," said Powell. "We had a business decision to make with the Parlin project, and it made sense from a lot of aspects. One of the key factors was state and local incentives that allowed us to structure a power purchase agreement that was agreeable to all the parties involved." Powell described the business relationship with Tangent Energy as "very cooperative." "Having that cooperation is an important component of a construction project," said Powell. 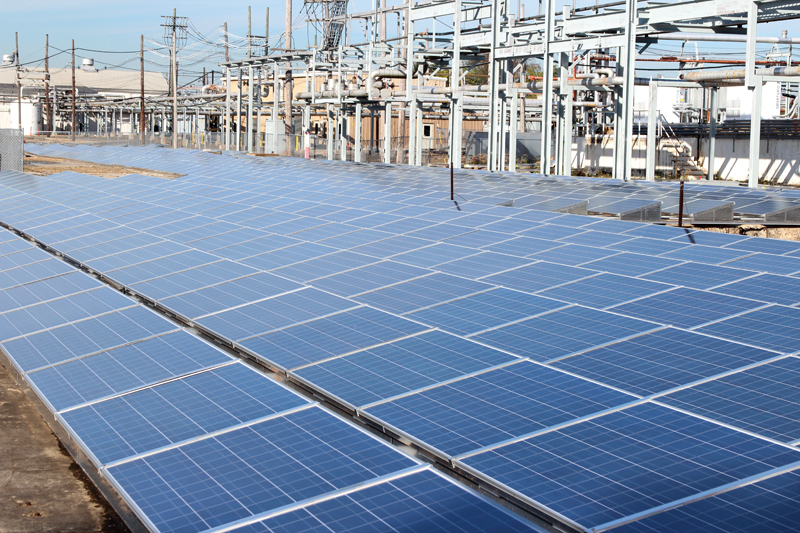 "Tangent was easy to work with—they had worked with DuPont before on some of our other solar projects. They presented the challenges of the Parlin project upfront and then provided a plan to work out those challenges." The relationship with DuPont certainly works for Tangent Energy, who were pleased to be involved. "As the leading supplier of materials to the solar industry, DuPont could choose anyone to integrate solar energy into their own facilities," said Dean Musser, president and CEO of Tangent Energy. "We're proud they selected us." Tangent has consistently been able to meet the rigorous safety, operational, and economic standards of DuPont, he added. Tangent Energy says its business model reverses the traditional utility-driven approach to developing the smart grid, in that it partners with commercial and industrial customers, such as DuPont, to optimize the "grid behind the meter." By providing clean energy assets and technologies at no capital cost, Tangent says it saves commercial and industrial energy customers 20 percent-plus while increasing the amount of renewable content in their supply. It actively manages on-site assets to decrease a customer's reliance on grid-sourced energy, especially during peak demand periods. Tangent was the general contractor at Parlin; it used a number of suppliers on the project. In addition to the SolarDocks racking, two Solectria SGI-500 and one SGI-250 inverters were installed. Two electrical contractors were used on the project, Delaware-based CMI Solar and Electric and The Tri-M Group of Pennsylvania. Tri-M helped with the design and did most of the layout and high voltage work to tie into the DuPont power system. CMI did the panel work, installing the panels on the racks and interconnecting the panels. Tangent's Dean Musser said the site did present a bit of a challenge, though it was surmountable. "Many industrial sites have pipe racks and steam lines that are elevated above ground," he said. "The challenge was to find the appropriate piece of land without any shading issues for the solar array. It took a bit of time from an engineering perspective to determine that, but once that was done, the project worked very well with existing site conditions. Essentially, we took the features of the site and engineered around those features." Musser said the concrete slabs from the foundations of former buildings on the site made for "a fantastic foundation" for the solar project. Tangent was under no extreme pressure to get the project completed by a certain deadline, though all parties were interested in getting it done in a timely manner. "We all wanted the project completed as soon as we could get it done," says Musser. "The issue was that we were building the project in the midst of turmoil in the New Jersey SREC market, so that created some timing issues—we needed to make sure we had the proper financing partner that would take a long term view of the SREC market. We were fortunate to line ourselves up with financing partners that wanted to work on the DuPont site and wanted an asset on the DuPont site." Laurel Capital Partners, an on-going project financing partner for Tangent Energy, funded development of the project with First Niagara Bank. As noted, Tangent Energy has done a number of projects with DuPont, including a solar project on a signature company office building in Wilmington, Delaware, Project Renaissance. "The most important aspect of any Dupont project is safety. We spend a lot of time making sure employees are safe, and everything was done in a safe environment," says Musser. With the project complete, results—and power—are coming in from the solar array. DuPont's Logan Powell explained that the Parlin project is in some ways a "living lab" in that it will give DuPont the opportunity to measure the performance of panels. In addition to the Apollo panels used on the project, about 20 percent of the panels are Yingli crystalline silicon modules. "We understand the importance of levelized cost of electricity at DuPont and how materials perform. The Parlin project gives us the opportunity to expand on that knowledge and have in place different technologies and different materials that we can monitor over a period of time." The living lab may show that the Apollo panels could potentially perform better than the crystalline silicon panels, in part due to weather conditions. "In this part of New Jersey, we have partially cloudy days, and the amorphous Apollo panels will turn on under low light conditions and could run longer than the crystalline silicon panels. By having the panels side by side, we will get excellent data on how they perform." The DuPont Apollo modules at Parlin are made with DuPont materials, including Tedlar polyvinyl fluoride film-based backsheet. The Tedlar is said to provide photovoltaic modules with superior protection against the elements beyond their expected 25-year lifetime. Projects such as Parlin are part of DuPont's overall goal to continue to make product improvements in their solar materials. "For us in materials, it's about increasing the power output and increasing the lifetime of materials—those two things can help reduce the cost of solar," says Powell. Longer term cost—and performance—is something the company is focused on, he says, and it is working to communicate their importance to customers. The message of delivering quality and performance can sometimes get lost when some companies chase the most inexpensive solar panels. "People aren't always thinking of lifetime ownership costs and performance over time. Good materials constructed in a good module will perform better over a longer period of time and provide payback quicker—and deliver a more reliable stream of energy," says Powell. Notably, solar projects also help companies achieve their sustainability goal of having a smaller environmental footprint. Powell noted that more large companies are looking at developing their own power or having third parties do the development through a power purchase agreement. The Green Power Partnership of the EPA works with a wide variety of organizations, including Fortune 500 companies, to support the development of new renewable generation capacity nationwide. On-site generators of renewable energy include such blue chip names as Microsoft, Walmart, Starbucks, and McDonald's. For those companies looking at doing large scale on-site solar, Powell advised that possessing flexibility right through the process is helpful. "All projects have unique challenges around them; very few projects are similar. From one project to another, you might be working in a different geographical area, with a different electrical company or with a different EPC. "If you are starting down the road of developing a solar project, you need to be flexible. Incentives come and go and change as you move through the process. You have a lot of stakeholders who have requirements, and you need to have agility built in to what you are doing to address those requirements."